Although we're still several months away from the reveal of the next Samsung flagship smartphone, the first details about the Galaxy S7 have already started to emerge. We reported to you a few days ago, Samsung might launch two Galaxy S7 models, each with different displays: 5.2-inch and 5.8-inch. Today, new information about the Galaxy S7 popped up online, which provides us with some insight on the smartphone's performance. 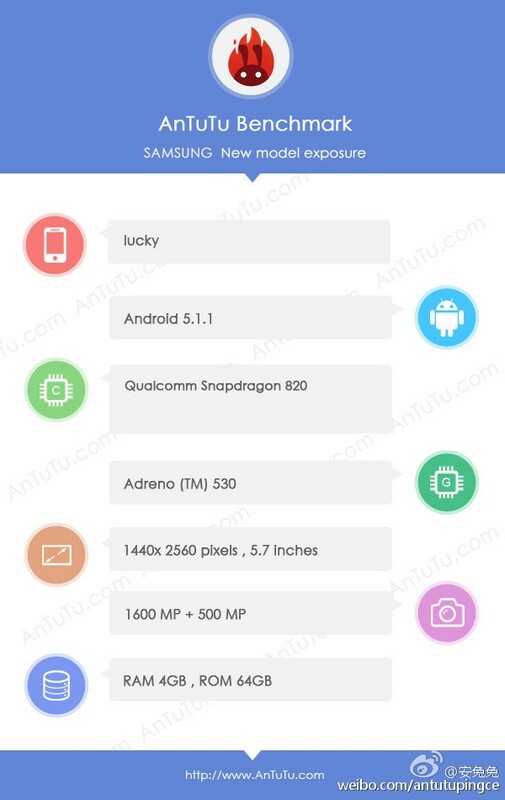 The folks over at GforGames have just spotted the benchmark results of a device called Samsung Lucky, which is likely to be the internal name for the Galaxy S7. The person testing the Galaxy S7 pushed the benchmark results in AnTuTu's database. These results come in tow with some details on the phone's specs sheet. According to the listing in AnTuTu benchmark, Samsung Galaxy S7 should be equipped with a Qulcomm Snapdragon 820 processor, an Adreno 530 graphics processing unit and 4GB of RAM. Also, the smartphone will pack 64GB of internal memory, but there's no mention of microSD card slot, so we must assume Samsung won't include one in Galaxy S7 either, just like it didn't include on inside the Galaxy S6 and Galaxy Note 5 flagships. Another major piece of information would be the fact that Samsung Galaxy S7 will boast a large 5.7-inch Super AMOLED capacitive touchscreen display that will support Quad HD (2560 x 1440 pixels) resolution. In addition, the smartphone will pack 16-megapixel photo snapper on the back, as well as a secondary 5-megapixel selfie camera. Last but not least, the Galaxy S7 prototype tested in AnTuTu runs Android 5.1.1 Lollipop operating system, which makes sense since Google has yet to release Android 6.0 Marshmallow. However, we can safely assume that Samsung's upcoming flagship smartphone will come preloaded with the newest version of Android.